Are you in Hanger Hell or Hanger Heaven? We are totally serious. Which is it for you? The easiest and cheapest closet transformation is having the same hangers – at least the same color!! Yet, we work with hundreds of clients (some of which have very expensive closets and clothes) who have the hanger hell scenario. We see all different colors and types hanging from the rods and the client wonders why their closet feels so disorganized. Maybe you’ve never thought about it or consciously noticed how disheveled you feel as a result of mismatched hangers. The reality is that your brain goes to color first and then type. So if your clothes are on hangers of many different colors it is even harder to make a clear choice. Or you can experience the sense of peace and order every time you look in your closet. Having consistent hangers makes it easier than ever to make your clothing choice! One favorite of our clients is the Huggable Suit Hanger. You better believe that we are in Hanger Heaven in our personal closets. Marla loves the white wood while Kate’s prefers the purple plastic. Full Disclosure: This post contains “affiliate links”. If you click an affiliate link and purchase something, the company gives us a small percentage of the sale, at no additional cost to you. This supports us in providing the FREE content and support we offer regularly. We carefully look at the products, services and people we recommend and always offer our honest opinion. We never, ever endorse a product or service that we would not purchase ourselves. No exceptions. In fact, most of the items/services we suggest we currently use ourselves. Heavy closet or happy closet, which do you want? 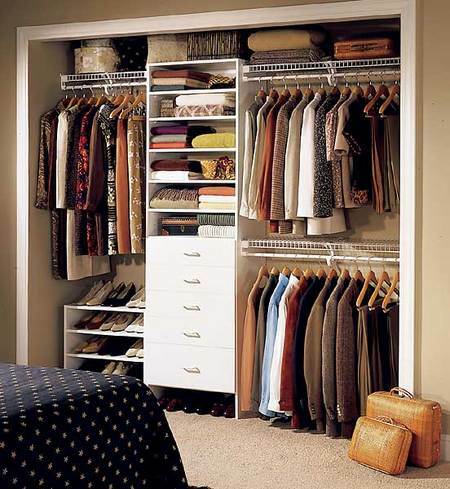 Join us in tackling closet clutter! We’ve all been there…it’s time to get dressed for the day and we dread going to our closet. Perhaps it is stuffed full of clothes most of which don’t fit any more. Maybe it fits, but just doesn’t feel good. Maybe you have just had it for too long. It’s true that we only wear 20% of our clothes. The other 80% are just creating clutter and chaos in the day. So our question is – how long has it been since you gave your closet a serious clean-out? We know it can feel overwhelming to tackle all those clothes. Would you like it to be simpler? Would you like the clothes that remain to be the ones you LOVE to wear so you love how you feel? We want to share two EXPERTS & SYSTEMS that can help you transform your closet. We know you will find guidance to create what you have longing for in your space and with yourself. Project 333 was created by Courtney Carver and is based on dressing with just 33 items or less for 3 months at a time. Wow! Even if you don’t make it to her level, she will inspire you to really clear out and she makes it FUN! And check out her amazing micro course that will step you through the process. It even has a playlist to bring in the FUN!! Get it here. Dressing Your Truth designed by Carol Tuttle is based on Four Types of Beauty and helps men & women find their type. Carol’s system goes deep, way beyond the surface of what you wear. Once determined there is a set of guidelines for each type that insure you will look and feel truly likely yourself. By the way – Marla is a TYPE 4 and KATE is a TYPE 2! Get the book or check out the online course. Please comment and let us know what you choose to do! Is your stuff adding to your life – or draining your life? We were recently inspired and changed by a thought provoking man and his message. James Wallman, author of Stuffocation, is revealing our relationship (as a human community) with our stuff and how it is changing. His message is much deeper than just letting go of stuff. We agree with him that releasing is just the beginning. As a global society we have more stuff than ever. Our homes are busting at the seams even after putting many of our “precious belongings” in storage. According to the Self Storage Association, the self storage industry generated over $25 BILLION DOLLARS in revenue in 2014 and continues to grow. What?!?! We are spending mass amounts of money to store things we will most likely never use, let alone see! Just think of the experiences we could have with all of that money. We love having things, but we realize they don’t really provide the profound connection, meaning and value that we all crave. Experiences like spending time with loved ones and exploring our world are what deepen our true enjoyment of life. The experience and the memory it creates are what we really crave. Everything takes time, energy and money – not only to buy, but to maintain. (Tweet this) We get to choose where we want our resources to go. Will it be taking care of stuff or having experiences? The choice is yours! We’d like to invite you to listen to James’ conversation about “Stuffocation” with Doug Fabrizio on Radio West.